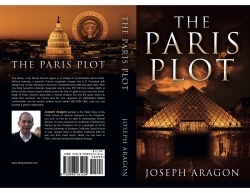 Paris, France, June 20, 2017 --(PR.com)-- In "The Paris Plot," a nail-biting debut thriller by Joseph Aragon, the unthinkable becomes plausible when an American president goes missing after he is targeted for war crimes by a powerful French magistrate. Only Isabella "Izzy" Stone, a heroic Secret Service agent in charge of the president's detail, can save the president from certain death and prevent international catastrophe. Kirkus Reviews calls "The Paris Plot" "a fast-paced international adventure featuring engaging characters," with an "exhilarating underground pursuit..."
In "The Paris Plot," a bitter former U.S. vice-president who detests current President Leyland Childs - and a powerful French magistrate with extreme anti-American views, precipitate a world-shaking crisis when a U.S. missile intended for a major terrorist target tragically kills a group of French schoolchildren. France erupts in outrage. The American Embassy in Paris is burned to the ground. Americans begin to attack everything French in the United States. President Childs flies to Paris to meet with the French president to defuse matters, but an ultra-nationalist French magistrate, Malevu, orders the president's arrest for war crimes, resulting in a deadly confrontation on the Champs-Elysées between the president's security team and French forces obedient to Malevu. Now Izzy Stone, head of the president's Secret Service detail, must do the near impossible to save him. She brilliantly devises a dizzying escape through Paris's secret underground networks of ancient catacombs and sewers, bursting forth from iconic landmarks in the City of Light. But will it be enough? Danger and violence forge a bond between Izzy and POTUS that neither had ever expected.